Corrie Gillies (guitar/vocals), Lewis Reynolds (drums) and Jon Arbuthnott (bass) make up Pinact, modern incarnates of ‘80s and ‘90s grunge. 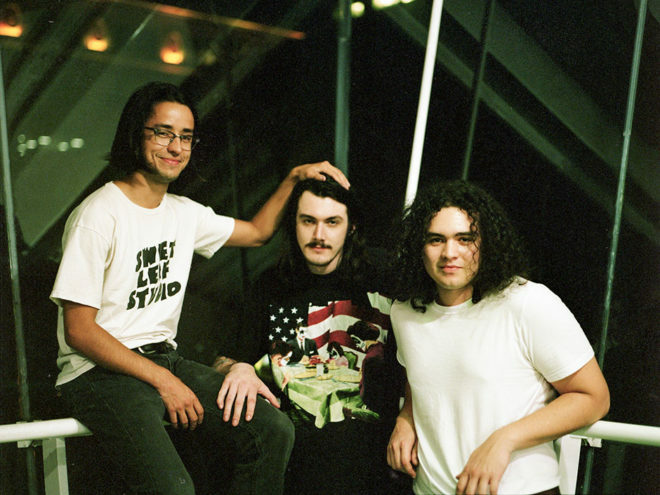 The trio, signed to New York-based label Kanine Records, is known for their chaotic and fuzzy, amplified sound and their DIY-style — putting on their own shows, playing at houses and basements, etc. Pinact’s debut album Stand Still and Rot was produced by MJ of Hookworms, and released in the spring of 2015. Specialty coffee house offering fine roasts and unique food service in a relaxed environment. Independent record shop in Glasgow, Scotland. Fiercely independent restaurant, bar, and music venue located in the center of Glasgow, and dedicated to keeping quality high and prices low. Music events are always free, drinks are cheap, and grub is modern and forward-thinking.